Attaches to belt, camera, briefcase or handbag strap. Zipper closure, genuine lambskin. Imprint on leather oval attached with ball chain add $0.77R. Lightweight, soft genuine lambskin. Zippered compartment quickly and securely attaches with hook and loop closure sewn to soft leatherso it is fully adjustable and comfortable. A great gift for an active person, it will hold money, keys or ID during exercise. Made of suede in assorted colors. We have made these styles for over twenty years in soft top grain leather and usually sell them as separate styles, unlined. 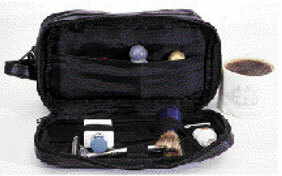 Now, in this package, the cosmetic bag has a waterproof lining and the price is incredibly low. Rolls up and snaps for space-saving compact travel. Genuine shearling fur to buff to a bright shine. Makes a great gift. Neutral polish included. Leather wallet with a pocket for a cell phone, shoulder strap. 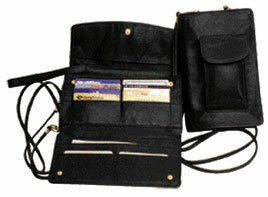 Snaps open to credit card pockets and zippered bill compartment. Top grain cowhide. Imitation leather interior. This cell phone case folds flat and is great for travel. It has three accordion-style pockets for cell phones or other accessories, and a small interior zip pocket for valuables. Great for travel, it is small and simple enough to be worn around your neck or over your shoulder. Genuine leather vertical wallet/ organizer on a thin, detachable shoulder strap will fit a checkbook, has a lot of pockets for credit cards and 2 zippered pockets for cash and coins. Imitation leather interior. 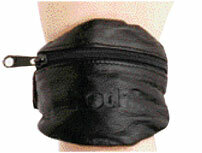 Separate, flap/accordion pocket with velcro closure on the back for glasses or cellular phone. 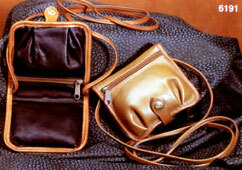 Pleated mini-purse with shoulder strap of soft, top grain cowhide. two zippered pockets, one open pocket on the back for convenience. Snap leather tab keeps it all together. Shoulder strap is genuine leather, doubled and stitched. The pleats give it exapandability so that you can squeeze in a little more than you thought possible. Great two tone effect from contrasting British tan trim. Excellent for suitcase or briefcase as it is only 3” high. Top open zip. One side zips. Leather handle. Large storage compartments plus zipered organizer section with elastic bands to hold accessories in place. Genuine top grain cowhide. 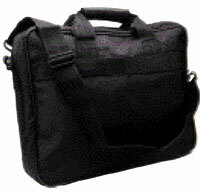 Removable shoulder strap for vertical or horizontal carry. 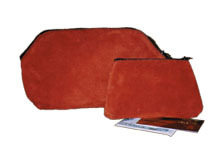 Cell phone pouch and interior credit card slots. Inside and outside full grain leather. Double Handles, with a leather handle wrap for comfort. 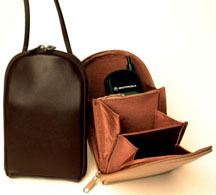 Many interior pockets for organization of file folders, cell phones, pens, and accessories. Heavy-duty black hardware. A comfortable leather shoulder pad on an adjustable, removable strap adds versatility. 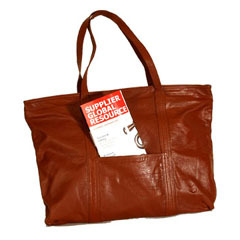 Leather shopping tote with zippered top, open outside pocket, zippered inside pocked, and lining. Lifetime Leather™ saddlebag style organizer with shoulder strap and belt loop. Inside zippered leather pocket provides additional security. 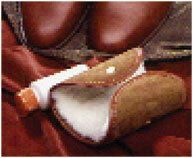 All genuine full grain leather with no linings to wear out. Made in the USA.